Japanese Shorts on the Line. In honor of the Shorts on the Line sewalong hosted by the fabulous Imagine Gnats and Small + Friendly, I'm sharing a pair of shorts I made a little while ago. It's a really lovely book, full of gorgeous pictures and fun patterns. You can buy the book here (referred to as the "Let's Go Out GIRLS Clothes" book by Yuki Araki), from Pomadour24, who's got the best selection of Japanese sewing books around and is great to work with. 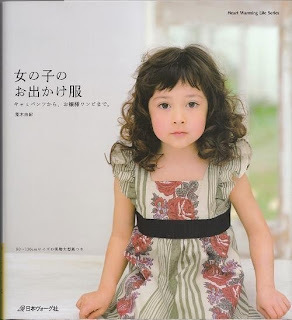 Japanese Sewing Books -- contains book reviews with loads of photos, a dictionary of Japanese sewing terms, tips for using Japanese sewing books, a guide to understanding Japanese patterns, and even some free patterns. Very, very useful stuff. Lemonade Adelaide -- a lovely gal who sews great things for her kids, a series of sewing tips for using Japanese patterns, and an awesome library of garments sewn from Japanese books. Japan Couture Addicts -- a French blog with a really impressive number of examples of things sewn using Japanese pattern books. Just find the cover of the book on the left-hand side and click it. Very helpful when deciding which books to buy and for getting fit ideas. I cannot post about Japanese patterns without this one tip: You must add seam allowances! Most of the books I've used contain a little diagram showing the recommended seam allowances for each edge of each pattern piece. Some edges will show 1 cm, others 2 or 3 cm. I've never understood why we need different seam allowances different places (except maybe hem allowances; I do get that). I'm such a rule-follower that I always go with their recommendation, but I often find myself wondering why I did. In addition to seam allowances, the other challenge I experience with Japanese patterns is size. They use a centimeter system, which I believe is supposed to relate largely to height. Each book contains a size chart, but when you don't read Japanese, it's only minimally useful, so there's a bit of guesswork involved. In the past, the sizes have correlated pretty well with European sizes (Hanna Andersson, for example). 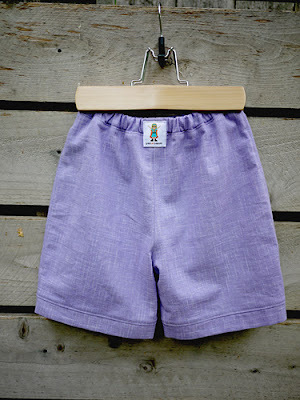 Now, back to the lavender shorts. If you're wondering why there's no picture of my girl wearing them, it is because they don't fit. I made a size 130, the largest size in the book. That's about what my daughter wears in Hanna Andersson, and it's right-on for height. The size chart in the book indicated that it's for a 9- to 10-year-old girls, and that's pretty consistent with the size my daughter wears (nevermind that she's not even 7 yet). So everything indicated that 130 should work perfectly. I used recommended seam allowances and sewed with care. But these are some tiny 130s! They fit my son, who's 4.5 and a 110 in Hanna Andersson. But he had no interest in lavender shorts.